We’ve opened (or at least we will have opened, if the opening gods have smiled upon us) our new-new-old-old Lucky 32 restaurant in Cary. Our websites are up and running now. 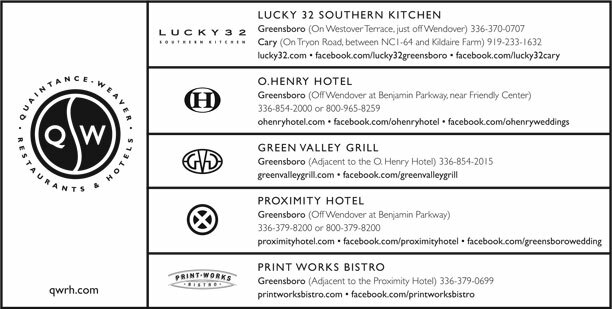 Please check them out and drop us a line at qwrh.com, greenvalleygrill.com, o.henryhotel.com, or lucky32.com (they are all linked together) – we’re just a click away. and old because the design is a throwback. We were determined to build something that would look good now, wear well, and still look good fifty years from now. We studied free-standing buildings from a half century ago that still look good, then designed this restaurant with them in mind. Our thinking is, if these buildings looked good fifty years ago and they look good now, chances are they will still look good fifty years from now. Modifying our design is scary because fourteen years ago we conceived our value system then applied it at every juncture in the design, menu and people aspects of our enterprise. Enough people responded favorably to it all that we are still around, so “what’s to fix?” Well, we decided that we’re not “fixing” anything; we’re progressing. And we’re ever mindful not to mess up an aesthetic or logistic positive. It hasn’t been easy, but the process has been fun and fulfilling. You can see the new exterior from this sketch but you can’t see Raleigh artist Matt McConnell’s handiwork on our light diffusers and tulips. Nor can you see the secret garden, the inviting bar, or the presence of this building on a very special chunk of earth. The siting of the restaurant is great; as the saying goes, “You would pick it as a camp site.” There is even an adjacent trail, perfect for an after-lunch stroll. Please visit us and we promise the highest quality food and drink at a good value with prompt, friendly attentive service in a clean and comfortable environment, and an outstanding menu with an impressive selection of specials…the exact values we started with those fourteen years ago. Our new Cary Lucky 32 is located at 7307 Tryon Road, between NC 1-64 and Kildare Farm Road. Drop in or call 919-233-1632 for reservations or call-ahead seating. Check out our website at lucky32.com. Patricia Wells, world-renowned cookbook author and restaurant reviewer visited us in November while on tour to promote The Paris Cookbook. This new book features 150 recipes and cooking tips gathered during the past 20 years she has spent in the kitchens of Paris obtaining her “Ph.D. in food.” The Paris Cookbook was recently reviewed by the New York Times and her earlier work, At Home In Provence (inspiration for some of the most tasty selections on the Green Valley Grill’s menu), has been recognized with the James Beard Award for Best International Cookbook. The Green Valley Grill’s featured menu for November included recipes from The Paris Cookbook, and Patricia was our guest of honor at a dinner in the Caldwell Ballroom of the O.Henry Hotel, catered by the Green Valley Grill on November 29th. Fine wine flowed as some of Ms. Wells’ best recipes were enjoyed by our guests. A few of the dishes served were Toasty Salted Almonds, Brioche, Domaine Saint Luc’s Olive Cake and Frédéric Anton’s Risotto with Wild Mushrooms. Also served were La Cagouille’s Sea Scallops with Warm Vinaigrette and Les Allobroge’s Braised Lamb Shanks with Garlic. Dessert was delectable, including Bonbonnerie de Buci’s Fresh Lemon Juice Tart and Chocolate Gourmandise. Recipes for these dishes are in The Paris Cookbook and are simple enough to make at home. Our copy is already dog-eared from use! We would gladly keep Patricia Wells here on staff, but away she went to complete her tour of the United States, with stops in San Francisco, Boston and New York, where she taped appearances on Martha Stewart Television and NBC’s Today Show. We can’t wait for her next visit when she shares more of her expansive food knowledge and her warm-hearted spirit. For more information about Patricia Wells visit her website at patriciawells.com. The O.Henry Hotel has been recognized with the AAA Four Diamond Award for the third year in a row. We are honored and humbled.